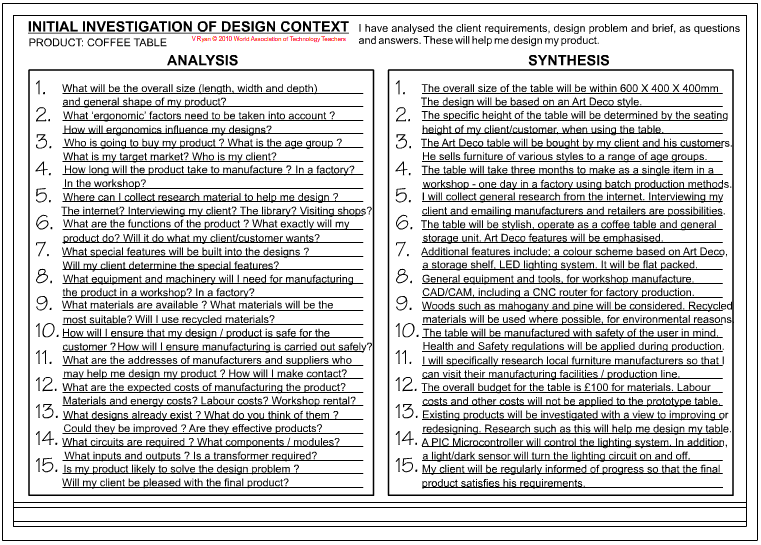 The ‘Synthesis’ is the section that follows the ‘Analysis’ and is the answers to the questions. Usually it is impossible to answer all the questions until you have nearly completed the the design project. You will find that some questions can only be answered when the research section has been completed. For example, any question on the choice of materials, or the way ergonomics is applied to your project, must be answered after you have researched these important areas. 1. Will the design be safe ? My design will be safe because I will test a model/prototype first. 2. What materials are available ? What materials will be the most suitable? Compressed polystyrene will probably be the best material and I will use it if my research tells me it is light and strong. 3. What will be the overall sizes / dimensions ? The dimensions will be - 300x450mm. 4. What will be the overall cost of manufacture ? I expect my solution to cost no more than £9.99 to manufacture. I will work out this cost by looking at the cost of materials and labour in the research section. 5. How long will it take to manufacture my product ? My design will take 15 hours to manufacture by hand and 20 minutes on a production line. 6. Can my product be manufactured on a production line ? I will set up a small production line composed of 4 people (add a little detail). 7. What is the most popular shape for the product ? I will carry out a questionnaire to help me work out the most popular shape. 8. What colour scheme is the most suitable for my product ? My questionnaire suggests that a blue/green based colour scheme will be the most interesting. 9. What are the functions of the product ? The product will do the following: (list what it will actually do). 10. What type of circuit is required ? Is a timer required ? Are flashing lights needed ? I need a timer and a flashing light circuit. 12. What special features need to be built into the designs ? The solution will also include movement. 13. What ‘ergonomic’ factors need to be taken into account ? I will carry out ergonomics research to work out the size most suitable for my design. 14. What designs already exist ? What do you think of them ? Could they be improved ? My design will improve any existing design and it will be cheaper. 15. What are the addresses / email addrsses of manufacturers and suppliers who may help me design my product ? The following manufacturers will be contacted: (list addresses). 16. Where can I collect research material to help me design ? 17. Who is going to buy my product ? What is the age group ? My design will be aimed at the general public. 18. Is my product / solution likely to solve the design problem ? My design will completely answer the design problem. 19. What equipment and machinery will I need for manufacture ? I will need general tools and machinery to manufacture my design. 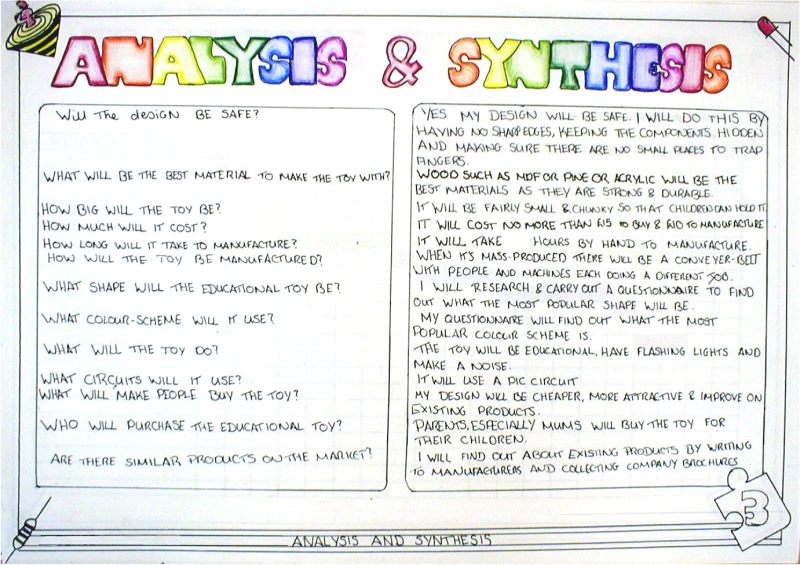 The synthesis shown below has been produced for a project based on an educational toy . 1. The synthesis (answers) should be general, do not try to be too precise. For example, if you are answering a question about choice of colours for your project, list a range rather than a single colour. This will allow you to change your mind later. 2. By the end of the project all the questions posed in the analysis should have an answer in the synthesis. 3. The analysis and synthesis can be on separate pages if necessary, although usually they fit comfortably on the same sheet. Remember, it is not always possible to answer every question in the analysis straight away. You may find that some questions cannot be attempted until after the manufacturing stage. The presentation of the synthesis is usually the same as for the analysis. Use the same colouring techniques and style of writing and layout on the paper.